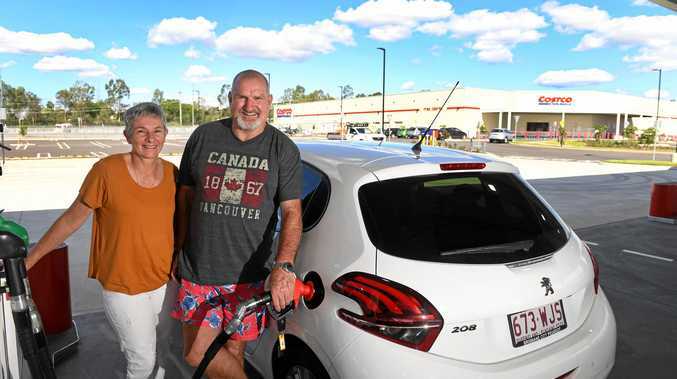 DAVE and Janet Hines are pleased as punch with Costco Fuel's Ipswich opening and it looks like it's set to save drivers up to 13c/L compared to other service stations. "My car takes nearly 200L so it's a good saving for me," Mr Hines said. "Any savings is a good saving in your every day life, it means you can buy something else," Ms Hines said. The couple, from Eastern Heights, signed up last August and have been eagerly anticipating the opening of the petrol station and warehouse. The mystery of what Costco stock is half the fun for Ms Hines. "You hear about people who live near North Lakes and they tell you all about what you can get - it sounds so fun." Why is all Costco fuel only able to be purchased at the pump? Costco Fuel is just another quality product and paying at the pump allows for a quick and easy refuelling experience for members. Costco say this allows them to maintain low prices. Which payment cards are accepted at Costco Fuel stations? Costco accepts all debit cards and all major credit cards - Visa and Mastercard- all issued with a PIN number. Cash payments cannot be made at Costco Fuel stations. Costco does not accept Motorcharge, Motorpass or any Fleet Cards. How do you activate the Costco Fuel pumps? You need to be a current Costco member to be able to dispense fuel at Costco. Upon successful membership validation, transactions must be then 'pre-authorised' with a payment card, to check there are available funds on the card before the fuel transaction can commence. This 'pre-authorised' checking is important because we are an unattended fuel station. Credit and debit cards are checked ("pre-authorised") by the member's bank after the cardholder has entered their PIN to verify there are available funds on the card before the fuel transaction commences. Similar to securing a hotel room or hire car booking, the selected amount is authorised before the transaction takes place. Once the transaction is completed, only the actual amount of the fuel purchase is charged to the card. The "pre-authorised amount" is then released by the member's bank. At no time does Costco receive more funds from your bank than that of the amount of fuel purchased. For example, a customer selects to fill their car up to $75 and only fills $50. The $50 will be charged to the customer's payment card. The pre-authorised $75 will be released after the transaction. The "preauthorised" amount held by your bank can take up to 14 business days to be released. The time of the release is dependent on the card issuing bank. Members are advised to check with their banks should they experience any delays in this authorisation process. Can I get a purchase receipt using Costco Fuel? Yes. Purchase receipts (tax invoices) can be printed from the pump as soon as you hang up the nozzle. If you decide after the transaction has finished and reset that you want a purchase receipt, you can insert your payment card into any pump on the forecourt and choose the 're-print receipt' option and a duplicate receipt of your last transaction will be printed. Is there a purchase limit on a single transaction? Yes. Customers are able to refuel to a maximum value of $999. Should further fuel be required, members must simply go through another transaction process to another pre authorised amount. Does Costco sell High Flow Diesel? Yes. Costco has 4 pumps that dispense high flow diesel specially installed for trucks. Where does Costco source its fuel from? Currently Costco sources its quality fuel from Mobil which is specified to meet Australian Standards. Can I obtain an MSDS or fuel specification sheet for the fuel sold at Costco? Yes. These are readily available from Costco upon request.